Modern cars with their computer controlled systems have brought about a big change on the way we diagnose faults with cars. At I.G. 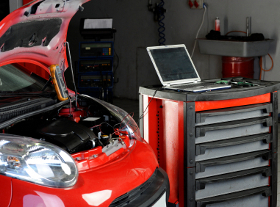 MacCullock & sons we have the latest, state of the art, equipment to interrogate your cars electronic systems, allowing us to quickly identify faults and make a repair. Come in and see us or call 01837 52776 to book your car in.